Recently we got a chance to work on Concrete5 CMS. It was new challenge for all and for us who are into CMS website development and it seems we have successfully concurred it. Being website development company, we thought it will be good to share something about Concrete5 CMS so other people can learn and use it easily. Unlike any other CMS, there is no specific backend which needs to be accessed, where we need to manage our content and display it at front end. We can manage content by adding/editing through frontend only. For that we need to enter in edit mode, start editing page by adding/editing blocks. Here we have options to add/edit pages, page types, themes and many more stuffs. In terms of administration, both the CMS Website development technologies do a fairly even job of abstraction coupled with efficiency, but as I said earlier unlike any other CMS, there is no specific backend in Concrete5. 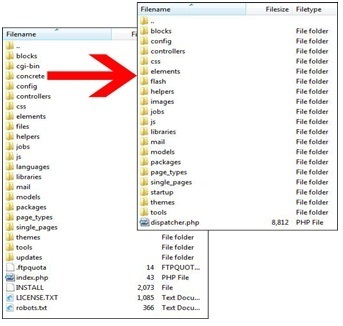 That is why it is easy to manage content in Concrete5 compared to that of WordPress. Underlying model of blocks in a page is very strong aspect of Concrete5. When adding content to a Concrete5 page you are working directly on the page design, so you can see what you are doing while doing it. In WordPress, you are behind the scenes, so to see the changes in WordPress, you must launch a preview page. Concrete5 has a CMS that is very clear and there is nothing confusing about it. WordPress website development confuses some people, I know because people are always asking a WordPress developer questions about the settings, plugins, functionality and more. Concrete5 also has tons of add ons just like WordPress, so you can add a blog also. Generally, a newbie is more likely to begin with WP and then move on to Concrete5. In easier words, Concrete5 user base is such that it can and does include migrants from WP. On the other hand, WordPress user base generally has permanent migrants from any other cms but rarely from Concrete5. Trust me, pick any topic: administration, security, target audience, update mechanism — you will have a hard time claiming WordPress superior to Concrete5. I personally prefer Concrete5 over WordPress as it was designed as a CMS system. WordPress is a blogging platform turned CMS. Concrete5 offers a lot of flexibility for a full featured website. Technically speaking, both systems are capable of handling your needs. Ultimately it comes down to how you will be using the site. Numerous third-party themes and documentation resources. At LetsNurture, we have thrived in providing WordPress website development services. You can also hire Dedicated WordPress developers love to work on WordPress as it enables them to have a control on the layout of the site and makes easy for the clients to make edits whenever needed. Apart from configuring some of the best plugins for your website, we will also conduct regular visits and tests to ensure that it runs smoothly. Rest assure when you work with us and know that your website is in good hands. Get in touch today for any of your requirements for an existing or a new website.